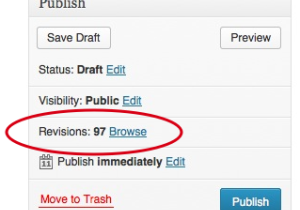 Getting to the revisions screen is easier than ever with a new link in the Publish meta box. The All New Revisions UI and numerous bug fixes! The revisions system in WordPress has been given a complete overhaul in the new (upcoming) Version 3.6 of WordPress. The new version of revisions patches several longstanding bugs and issues with the revisions system and introduces a slick new user interface for viewing and comparing revisions. The revisions interface focuses on two primary use cases: undoing mistakes by finding the last correct revisions, and reviewing changes as part of an editorial workflow. To improve these uses, a completely new UI was created, and numerous bugs were fixed.